Homepage » Poker Tips » How to Win a Poker Tournament » Accelerating through the Middle Stages of a Poker Tournament » To play Marginal Hands or not to play? Many players see a pretty hand and over estimate the value of their holdings. This is particularly true of hands like K-Q. K-Q is only 40% to win against a mediocre hand like A-2, so that shows the true quality of the hand even though it looks very pretty. Surprising? Maybe, maybe not. It depends on how long you have been playing. The point of this article is not whether or not you are going into the flop as a favourite, it is how much opportunity you are giving someone else to get lucky. 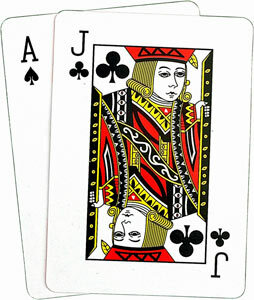 If you reverse the roles then so that you are holding A-2 and you are going to call against the K-Q. You are a favourite sure, but the maths says that 4 out of every 10 times you are going to lose. So unless you want to gamble then you can see why these types of hands are not good hands at all. In the early stages of a big field tournament, particularly the large $5 and $10 events with guaranteed payouts of up to $10k you have a lot of “dead money” in the prize pool. This is money that is contributed by many players who have never played tournaments before and have no idea what they are doing. They usually bust out in the very early levels playing K-J or K-Q. These hands look so pretty but they are really big trouble for the serious player. When you raise it up with A-J from mid position and get several callers you have absolutely no idea what you are up against. You are probably behind let me tell you. We’ve already discussed using marginal hands as speculative hands where we play if it is cheap to do so and are looking to hit a monster hand such as a flush, straight or set. The problem in the middle to late stages of a tournament is that it is no longer cheap to play these speculative hands. The blinds have increased and there is a lot more aggression and money flying into the pot from opponents during these stages. The only way you can continue to play speculative hands is if you have a big stack where the amount you have to put in is relatively small in comparison to your stack size. In fact as a big stack these hands are excellent to use to throw your weight around and bully your opponents. On the other end of the spectrum you may be forced to play a more marginal hand if you get to a short stack and need to find an opportunity fairly quickly to make your move. In these situations you are just looking for the best opportunity and hand that you can get in that short space of time, chances are it won’t be a premium hand and you will have to do it with a marginal hand. Having said that for most, the average and big stacks, the middle stage is still all about patience and discipline. Many players, once they have amassed a stack of chips start donating them very quickly back to the table with a succession of raises and attempts to steal the blinds without thinking about what they are trying to achieve. What they should be doing is sitting tight and waiting for monster hands. There is no need to rush to try and force the action because you have so many players willing to gamble with you once you do enter a pot. If you keep gambling with marginal hands then you may get lucky once in a while but you will enjoy a lot more long term success using the middle stage of a tournament to try and build a big enough stack that will allow you to make more marginal calls with hands such as A-Q in the later stages when people start getting desperate and pushing in.